Check our prices page to see what you can save! This course is for anyone who is 24+ years who want to go for their full motorcycle licence (or if you are 21+ and have held an A2 licence for two years - refer to the Progressive Access page). 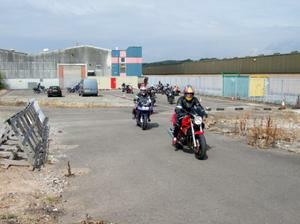 DAS is a direct route where training and tests will be carried out on a bike which is at least 595cc. After completing a CBT on a 125cc bike you may go on to do a conversion lesson which will give you experience on a 595cc bike. You will be using the same skills that you have mastered during your CBT and transferring them to a more powerful machine. After the conversion lesson you will go on to do lessons for your Module 1 and Module 2 tests. The Module 1 lessons are different from the Module 2 lessons and are described in more detail below. Gaining your motorcycle licence consists of successfully passing three parts whether you are going through the Restricted Access or the DAS route. These are; the Motorcycle Theory Test, the Module 1 practical test and the Module 2 practical test. 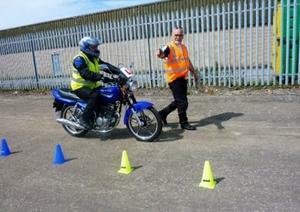 A Motorcycle Theory pass Certificate is required before you sit your Module 1 and 2 tests. You can, however, start your Module 1 and 2 training before you have passed your Motorcycle Theory Test. 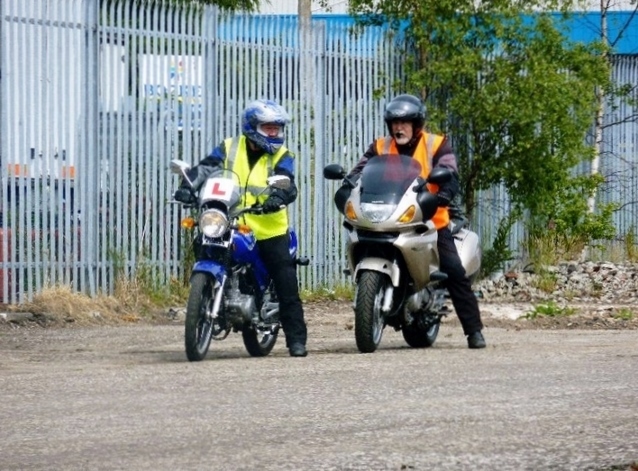 The Motorcycle Theory Test is carried out at the DSA test centre and you can book it by phoning 0300 200 1122 or going online http://www.dsa.gov.uk remember to select the motorcycle option. It costs £31 to sit the test. The Module 1 test involves demonstrating your slow speed manoeuvring skills by a balance control exercise, a slalom in and out of cones, a figure of 8, a slow speed ride at walking pace, U-turn in the road, a controlled breaking exercise. As well as an emergency stop and an avoid and break, which must be done at a minimum of 50kph (31mph). The majority of your Module 1 training will be carried out at the DSA site where you will sit your actual Module 1 test. We have access to the site at weekends to conduct the Module 1 lessons. The number of lessons required to get trainees up to test standard varies from individual to individual and depends on the trainee's abilities. There are two points to keep in mind when you are going for your full licence. Firstly, the size of motorbike that you use for Module 1 has to be the same size of bike that you use for your Module 2 test. Secondly, When you go for your Module 1 test it is important you remember to take your Theory certificate, CBT certificate and your licence. The examiner will need to see these before you take the Module 1 test. 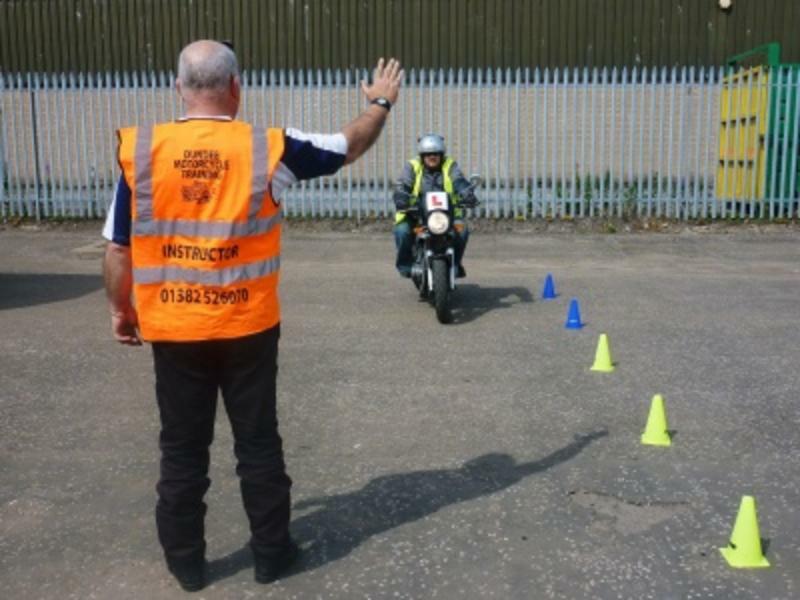 The Module 2 test involves you demonstrating that you can safely ride in a variety of road and traffic conditions on the same size of motorcycle that you used to pass your Module 1 test. The route that the Examiner will take you on will include things like roundabouts, slip roads, traffic lights and school traffic calming signs. The whole test takes an average of 45 minutes. It starts and finishes at the DSA site and is carried out on the road around the Dundee area. The Module 2 lessons are carried out on the road in 2 hour sessions. The number of lessons required to get trainees up to test standard vary from individual to individual and depends on the individual's abilities. Remember to bring your Theory certificate, CBT certificate and your licence, as the examiner will need to see these before you can take the Module 2 test.